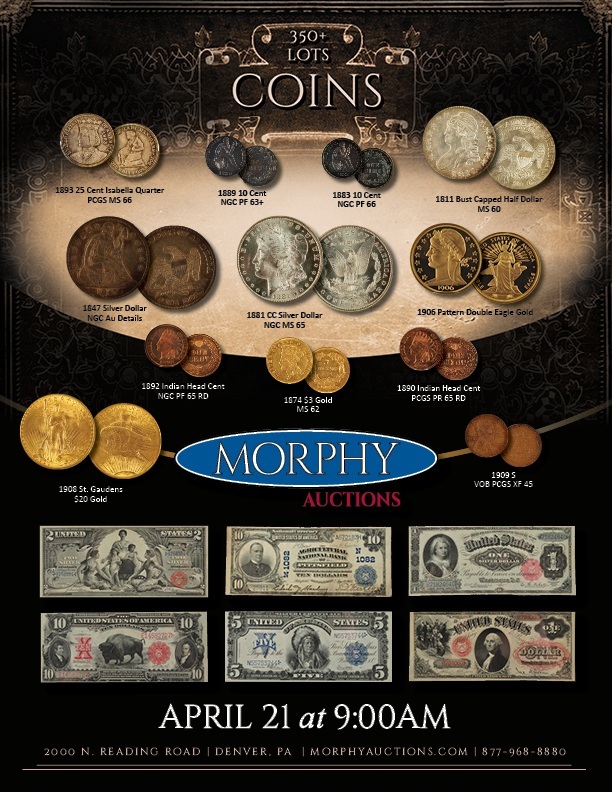 Morphy Auctions’ April 2016 Premier Coin Sales Event To Offer An Outstanding Selection of Fine and Important Metal And Paper Currencies. This highly anticipated, semi-annual auction features over 400 lots, including rare, commemorative, and international coinage, as well as historically important and visually stunning bank notes, certificates, and charters. It makes perfect ‘cents’ that this auction will tempt collectors with over 300 fine coins on offer, with examples dating from the 18th century onward. Lot #42, a 10¢ seated Liberty Dime from 1883, deserves a standing ovation. This coin, featuring Lady Liberty sitting on a rock with a liberty pole in one hand and a shield in the other, was produced from 1837 through 1891 and is estimated at $1,700 to $1,900. Lady Liberty also makes a head-turning appearance on lot #88, a rare “5 over 2” Capped Bust half dollar from 1815, estimated at $5,000 to $7,000. Due to the political and logistical realities of the War of 1812, the United States minted very few coins made from silver or gold in the early 18-teens. This 1815 half dollar was only minted 47,150 times; the fewest of any Capped Bust Half Dollar series produced. Silver dollars are a sterling category in this auction, with almost 50 examples on offer. Coin enthusiasts will without a doubt bank on lot #161, an outstanding 1884-O Morgan Silver Dollar, estimated at $2,000 to $2,400. This rarity was designed by mint engraver Charles Morgan and was in production from 1878 to 1904 and then again in 1921. This auction’s money trail leads directly to an outstanding selection of about 100 cut sheets, certificates and bank notes. Lot #312, a $5 Silver Certificate from 1899, is illustrated with the bust of handsome Indian in full headdress on the front and a prominent “V” on the back. This headliner is estimated at $5,750.00 to $6,500. Lot #317, a $10 Fr. 120 United States Note, is also a big deal. It features a huge American bison on the front and a statuesque Lady Liberty on the back. This currency, referred to as a “Bison” in the trade, is estimated at $4,000 to $5,000.